and up-to-date. In addition, it is not any more dependant on the rare Panasonic AN6682-chip. The board has not been tested yet, and is still beta status. So better be patient, and I will try it out for you soon. I also added the wireing for the automatic/manual-mode switching that you'll find in the bottom part of the schematic. 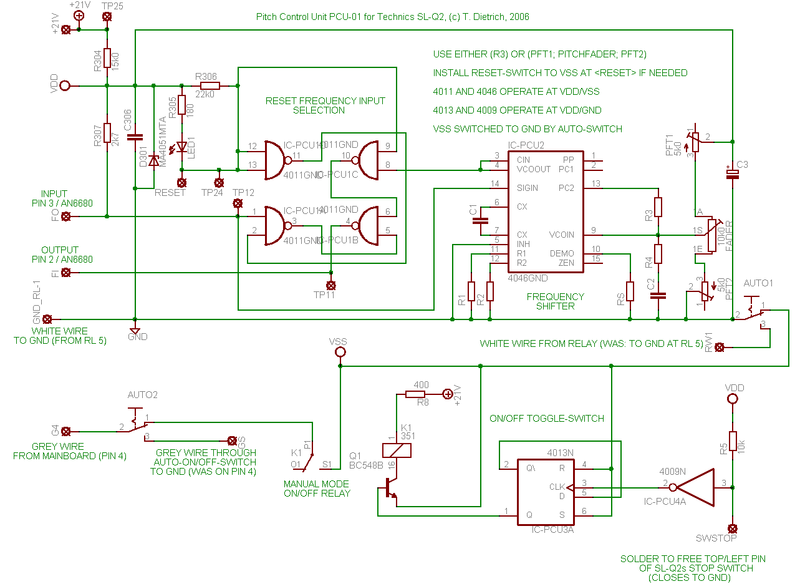 Eagle is a nice tool for making schematics and board design, although it can drive you nuts sometimes. I've made some minor changes to the Schematic. An new one will be online soon. of frequency limits. The Auto/Man switch works as desired. In the meantime, I bought the parts and put the PCU together on a prototype board, and ... it works! The frequency input (FI) on the AN6680 can be fed with a 5.6 volt square pulse with aprroximatly 50% duty cycle. a period of 3.6µs (277 KHz) will serve +8% pitch and feeding with a period of 4.1µs (243 KHz) will serve a pitch of -8%. the platter rotate a little unsteady (most likely due to the slow movement and limited number of magnets in the motor). spread the range to +/- 20%. R1, R2 and C1 are chosen accordingly. The values used will be published as soon as they are fix. 2. Adjust TPF1 and TPF2 to 0R0 reistance (full voltage range on fader). 3. Adjust R1 to a resistance of 10k0. 4. Adjust R2 to a resistance of 1M0. 5. Make a good guess at C1 and install it. 6. Check RPM at both extreme fader positions. If both, your lower and upper pitch can is reached or exessed, go on to point 6. If not, goto 5 again. 7. Put Fader on lowest pitch position. Set R2 so that your lowest pitch is approximately meat. 8. Put Fader on highest pitch position. Set R1 so that your lowest pitch is approximately meat. 9. Measure R2 and increase resistance value 5k0. 10. Measure R1 and decrease resistance value 5k0. 11. Put Fader on lowest pitch position. Set lower TPF so that your lowest pitch is exactly meat. 12. Put Fader on highest pitch position. Set high TPF so that your highest pitch is exactly meat. Now you have enough flexibility on all the variable resistors to compensate divergencies. realised, the installation of hardware and building of boards will begin.